Experience all the vibrant culture and rich history, admire breathtaking architecture, and take in all the sights of the world-famous San Antonio River Walk on the best ride in town with GO RIO River Cruises. 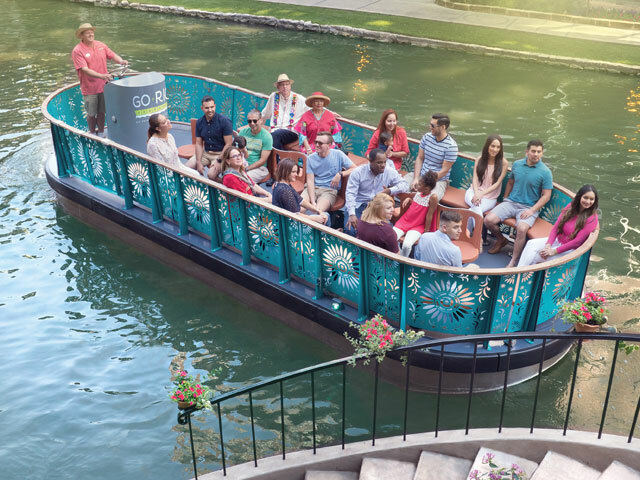 Climb aboard one of the eco-friendly electric river boats bedecked in the colors of Mexican folk art and enjoy a fun, educational, and inspiring tour of the River Walk. Not only is this a great way to see the heart of downtown San Antonio, you might just scope out a few new restaurants to try while you’re in the Alamo City. Floating along with GO RIO River Cruises is much more than a fun jaunt on the water. Instead, it’s a captivating journey to some of San Antonio’s most historic places. Cruise by La Villita, the city’s first neighborhood where General Santa Anna placed his cannon line during the Battle of the Alamo. Pass under Selena’s Bridge, where beloved Tejano superstar Selena Quintanilla Perez’s husband proposed to her. All the while, you’ll discover San Antonio’s American, German, and Mexican cultures with the help of your tour guide, who will provide fascinating tidbits of knowledge throughout your 35-minute journey. Need an easy way to get around the San Antonio River Walk? Hitch a ride with one of the Go Rio shuttles, which pick you up and drop you off at various locations within walking distance of some of the Alamo City’s biggest attractions. Keep an eye out for the Go Rio Shuttle signs and boats that are labeled as such. These shuttles run approximately every 45 minutes, although there is no set schedule for pick-ups and drop-offs. Explore the San Antonio River Walk and uncover the city’s diverse cultures and enthralling history on a tour with GO RIO River Cruises. An essential part of any visit to downtown San Antonio, it’s a great starting point to your other adventures in the Alamo City.